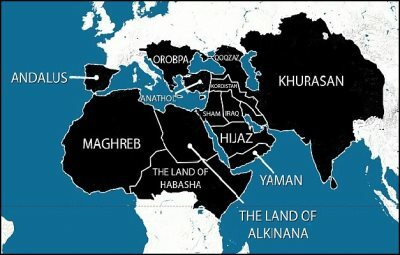 AFRICANGLOBE – ISIS has formally declared the establishment of a caliphate, or Islamic state, in the vast stretches of the Middle East that have fallen under its control, and has outlined a vision to expand into Africa. The announcement was described as the ‘most significant development in international jihadism since 9/11’. Upon declaring a caliphate, the Sunni terrorists – whose brutality in attempting to establish control in Iraq and Syria has been branded too extreme even by Al Qaeda – demanded allegiance from Muslims around the world. The announcement, made on the first day of the Muslim month of Ramadan, could trigger a wave of infighting among Sunni extremist factions that have until now formed a loose rebel alliance. Charles Lister, a visiting fellow at the Brookings Institution, said the announcement was likely the ‘most significant development in international jihadism since 9/11’. Spain, which was ruled by the Moors for 700 years until 1492, is marked out as a territory the caliphate plans to have under its control by 2020. 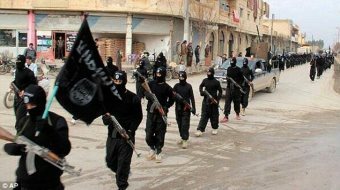 Elsewhere, ISIS plans to take control of the the Balkan states – including Greece, Romania and Bulgaria – extending its territories in eastern Europe as far as Austria, which appears to be based on a pre-First World War borders of the Austro-Hungarian Empire. The group insist the carving up of the Ottoman Empire by Allied forces after the conflict – commonly known as the Sykes-Picot Agreement – was a deliberate attempt to divide Muslims and restrict the likelihood of another caliphate being established. Following his appointment as head of the caliphate, ISIS demanded al-Baghdadi be referred to as Caliph Ibrahim – using the name given to the son of the Prophet Muhammad in order to strengthen the claim that he is now the leader of the Muslims and a direct successor to the prophet himself.